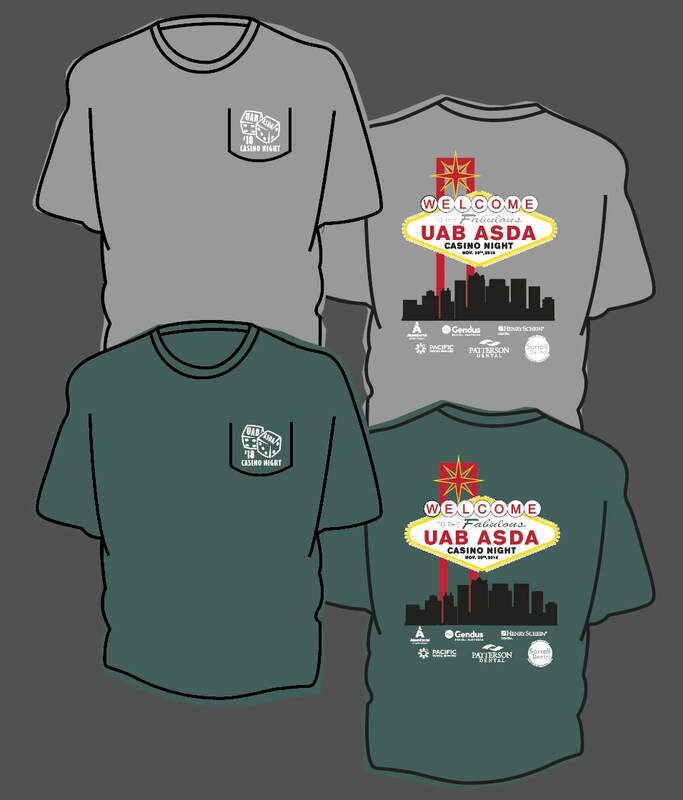 ​Come out to ASDA's Casino Night for a Cause on Friday, November 30th, from 7-11 pm! This year, proceeds will benefit Give Kids A Smile, a program launched by the American Dental Association in 2003 that has provided free oral health services to over 5.5 million underserved children. ​This is a cocktail attire event. There will be casino games with professional dealers as well as great prizes up for grabs. Casino games include blackjack, poker, craps, and roulette. It is sure to be a great time! ​With purchase of a ticket to the event, you will receive: two drink tickets (with cash bar for additional drinks), light appetizers, and chips to play casino games with. Chips can be exchanged for raffle tickets at the end of the night. 1. Fill out this form to RSVP and to order a shirt. *Students can buy ONE additional ticket at the student ticket rate for a guest or significant other! 3. Shirts are available in two colors and are $15 each, see below. Venmo (@ALASDA-Treasurer) and cash are also accepted. Early ticket sales will close on Thursday, November 29th. ​Please contact Ogden Deaton at ogdend@uab.edu with any questions.